Genealogy News Sheet Hiatus: I’m back home from vacation and seminar! My vacation was great! We played all day and slept late every morning. When the countdown to come home began, we drove slower and stopped more often. Crossing Montana, we stopped at the Montana Valley Bookstore! This is a favorite haunt of mine. The owner is a young wife of a mine official who travels several days of the month. She maintains a store of more than 100,000 used books. A few years ago, she went back to New Jersey and brought her mother out to Montana along with a truckload of more than 80,000 additional used books from her mother’s eastern store. Those books are being added to the shelves every day. What a treasure the bookstore is and how I love to stop there. The British Isles Seminar was a wonderful event–every chair was filled with eager genealogists waiting to learn and a Chairman who ran everything so smoothly that we didn’t realize the passage of time. The day was gone before I knew it–and I was relieved. The smoke-filled air from the many fires burning in Utah, Nevada, and California gave me asthma-voice I could not control. And by the end of the day, my voice faded. British Isles Genealogy Secrets: Your Insider Guide to Genealogy Research in England, Ireland, Scotland, and Wales by Linda E. Brinkerhoff and Arlene H. Eakle. 2007. Available from The Genealogical Institute, Inc. PO Box 129, Tremonton UT 84337-0129. (Not yet available online.) Special News Sheet Subscriber Price—$35.00 postpaid. 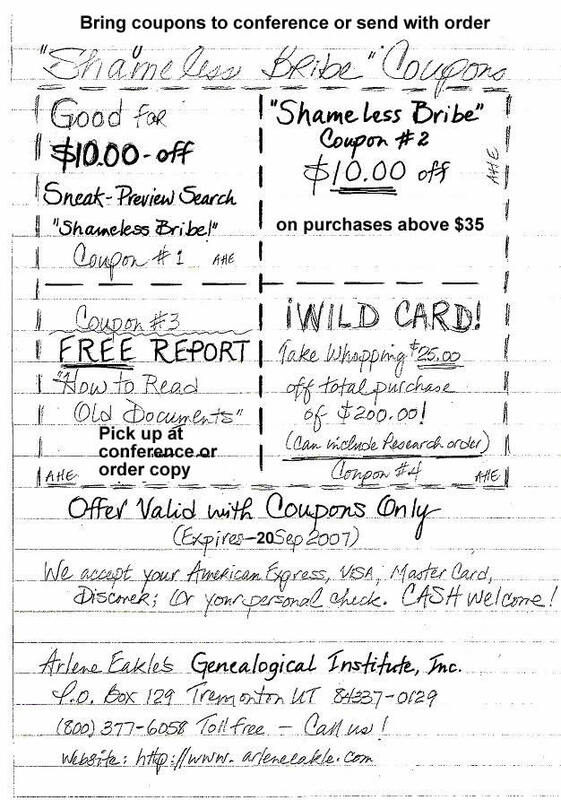 I often send a preliminary mailing to potential attendees of the seminars where I speak with a price list of our publications, a description of my presentations at the seminar, and a page of “Shameless Bribe” coupons. Since so many of you could not attend, I decided to give you the coupons anyway. The Price List is already posted on this website–select Catalog on the Home Page menu. The coupons apply to these items too. New Publications are NOT on the this current price list–they are brand new. When we began to publish genealogy research aids, we decided to price them by the page–every item is priced by the page. So every publication with the same number of pages, costs the same price. Easy to calculate. When we add the new items to the Price List, the cost of British Genealogy Secrets will be $47.00 plus postage, according to the number of pages in the book. The Special News Sheet Price listed above is just that–a special price for you, $35.00 postpaid. My thinking is that if you have a difficult research problem in the British Isles, you will want this brand new guide. And I am willing to bribe you all to order it. When you get your copy, look for NEW strategies and sources you have not searched before. And I will extend the same deal I gave to those who attended the seminar, if you don’t learn at least one new source, or one new strategy from this new guide, that you didn’t know about before, I will cheerfully refund the price of the book and it is yours to keep as well. Put me to the test. You have nothing to lose–either way. You can order by postal mail: Genealogical Institute, Inc., PO Box 129, Tremonton UT 84337-0129. P.S. Tune in every other day this week for a new post. I have some great sources to share with you–some you will not have heard of or searched before.